CURTAINS > WHAT ARE TAB TOP CURTAINS? 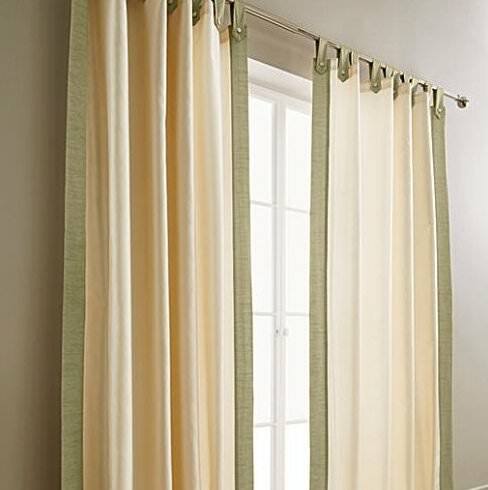 Tab top curtains feature exposed loops of fabric along the top. These wrap around the rail and support the weight of the curtain, for a vintage feel. Tab tops have been around for a while, long predating the invention of modern track systems, and for this reason they’re a great match for older properties. Perhaps the most obvious advantage of tab top curtains is the fact they’re typically very affordable. For one thing, they require far less fabric than pleated curtains. Another significant advantage of tab-top stems from their unique look. They’re less formal than other styles of curtain, and are a great match for newer properties, as well as more traditional homes. How far apart are tabs on tab top curtains? Typically, tabs are sewn at intervals of around eight inches. This can, of course, vary according to your personal preference. Are there any Disadvantages to Tab Top Curtains? A loop of fabric is obviously not as strong as a loop of metal. For this reason, tab tops may wear out more quickly than other types of curtains, particularly if they’re repeatedly opened and closed over the course of a day. For this reason, they’re best fitted where they’ll be used infrequently. As with all curtains, you’ll want to measure up before fitting. How wide should tab top curtains be? As wide as necessary to cover the window. In the case of tab top curtains, the measurements will determine the length of the rod, rather than vice-versa. First, measure the width of the curtain. To do this, lay it flat across a suitable surface. Next, you’ll need to figure out how much space your curtains will take up when they’re open. The tabs themselves, remember, won’t fold in on themselves. Multiply the length of each tab by the total number of tabs. You’ll need this much extra space on your rod. Now it’s time to determine the length of your curtains. Measure from the very top of your tab to the bottom of your curtain. Sill length curtains will need to stretch a little beneath the sill; floor-length curtains will need to be a little shorter so they don’t drag. Finally, we should see how thick the rod should be. For this, we’ll need to do a bit of maths. The circumference of a circle is the diameter times pi (3.14ish). So, the length of your tab times pi should give you the curtain rod’s maximum circumference. Saying that, be sure to give yourself some breathing space by subtracting a few centimetres from your diameter before doing the calculation. Bear in mind that this is the maximum circumference; there’s nothing to stop you matching large loops with a thin rail, provided that the rail is sufficiently far from the top of the window. Looking to shop for new curtains? View our tab top curtains, pencil pleat curtains, eyelet curtains, or slot top curtains.